mama elephant | design blog: Mama Elephant February Sneak Previews! Mama Elephant February Sneak Previews! Happy weekend, everyone! Today we're kicking off our February release which will surely get you all hip-hopping outta your seats! Let's move onto the sneak peeks, shall we? 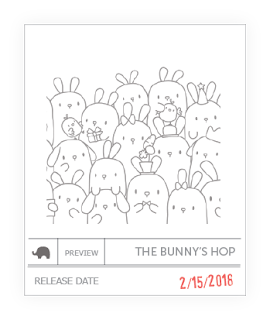 We've got the next installment of these cluster of cuties called The Bunny's Hop! These designs are so popular because they're so fun and easy to work with! Just stamp and color to your heart's content! We're back with the Little Agenda series as well with Little Bunny Agenda! Bite-sized and perfect for cards, planners, scrapbooking and little 3D projects! We've also got these storybook-like, whimsical illustrations coming at you. They're perfect for building a beautiful little scene! Picnic With Friends is chock full of cute little images just for that! On the flip side, there's Tea With Friends filled with the same style of whimsical storybook images. And we even incorporated some punny tea related sentiments! Yay! I love all these sweet bunny images! So much fun for spring! So sweet,The BUNNY AGENDA,YES PLEASE!!! I love the "with friends" stamps, very storybook like. OHHH! I'll take all of them, please!! Wow!! You know what I like!! So adorable! I have the dogs, snowman and cats! Cannot wait for the bunnies! Adorable bunnies, can't wait to buy them! These are so adorable! I don't know if my wallet can handle it. Oh my, oh my, so so cute! Awww such adorable sneak peeks!!! Absolutely adoreable! Can hardly wait to see cards made with these new stamps!